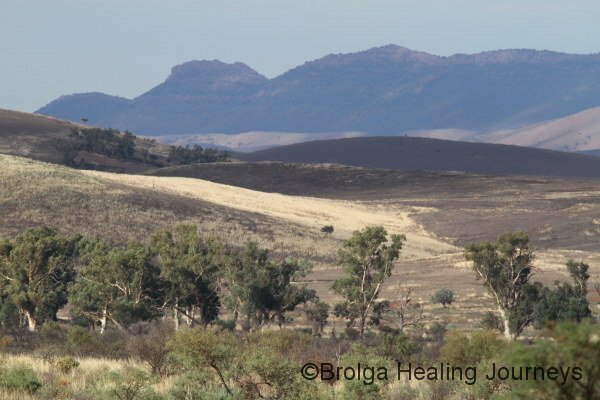 Our first stop after Scotia was Broken Hill – a rather gentle way to re-enter civilization. After a couple of months in the remote Scotia sanctuary we certainly appreciated the cafes, galleries and interesting streets and old buildings of the silver city. We intended a short stay but Mother Nature had other ideas, turning on the rainfall in a big way. 120mm or so in one afternoon and our short stay suddenly stretched to many days longer with highways cut in all directions. 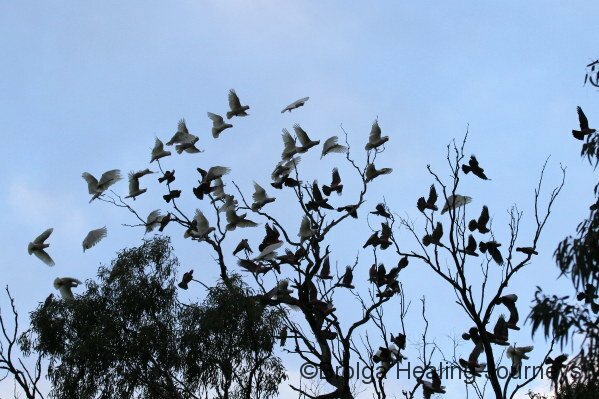 We had planned to head up the Darling River to re-explore that area and re-visit Louth, but could cross that off the agenda for now. 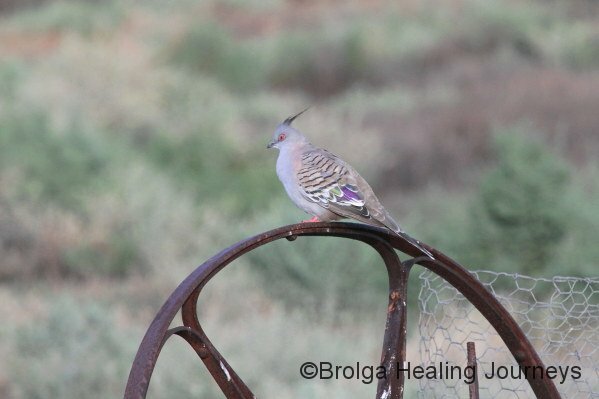 We also planned to spend a week at Buckaringa Wildlife Sanctuary in the Flinders Ranges, but Katja, whom we met at Scotia and now planned to meet at Buckaringa, was stranded at Scotia after flooding there. Okay – postpone that as well. 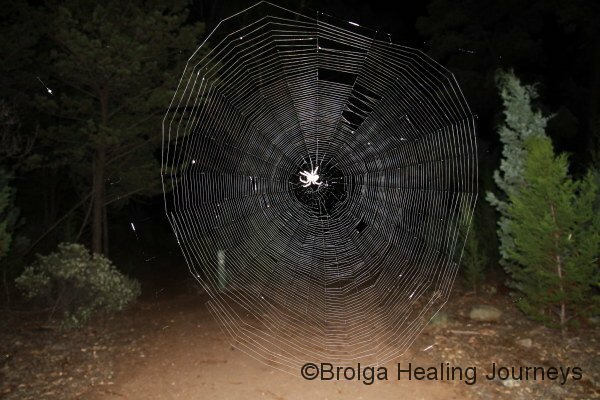 So, once the roads from Broken Hill re-opened, we decided on yet another visit to the Mt Remarkable National Park to bide our time in its beautiful surroundings until Katja could safely travel to Buckaringa. We go on and on about Mount Remarkable. 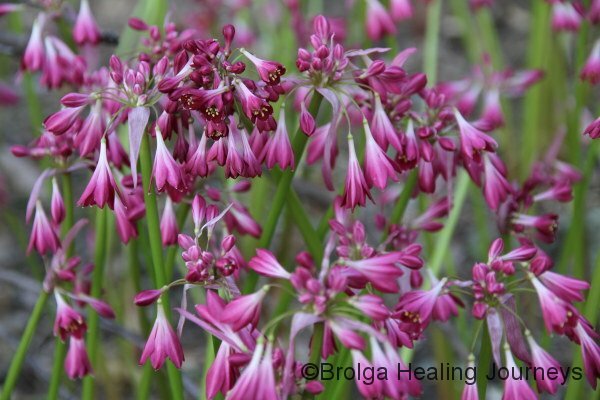 It received its name in June 1840, when Edward John Eyre explored Spencer Gulf. 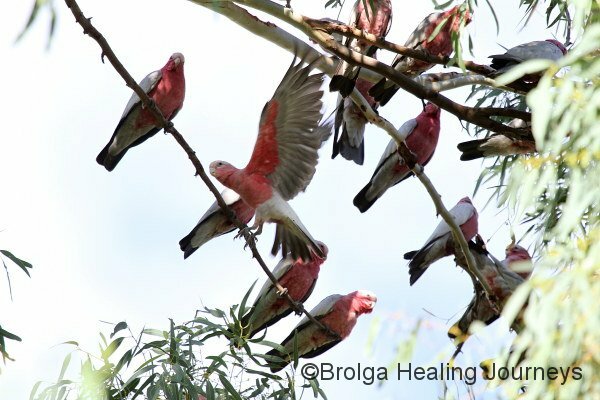 He was unable then to land at the head of the gulf (now Port Augusta) because of swamps and mud. 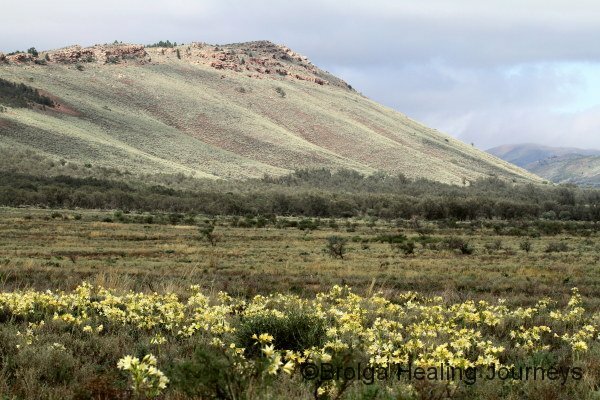 But he spied one prominent peak inland and wrote“..this, from the lofty way in which it towered above the surrounding hills, I named Mount Remarkable”. 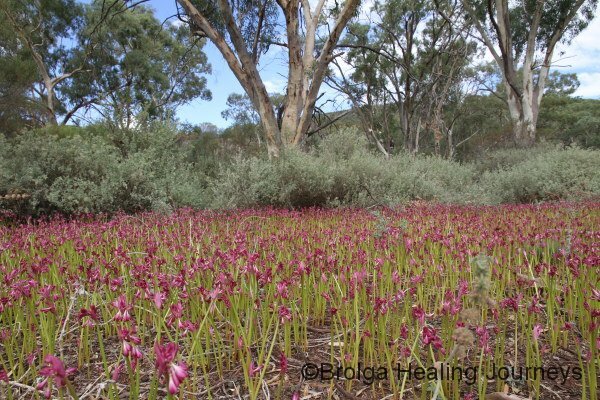 Although the mountain received its name because of its prominence above the surrounding hills, it really is a perfect description for a fascinating place, one abundant in wildlife, majestic and gnarled old River Red Gums, and spectacular geology. 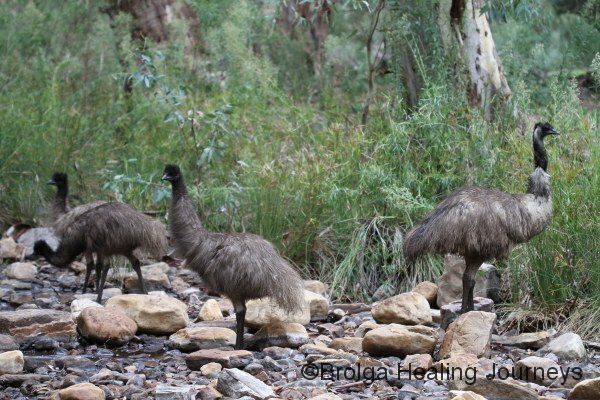 We have spent most of our time in the Mount Remarkable National Park camped at the foot of the mountain, at Mambray Creek, and did so again on this visit. 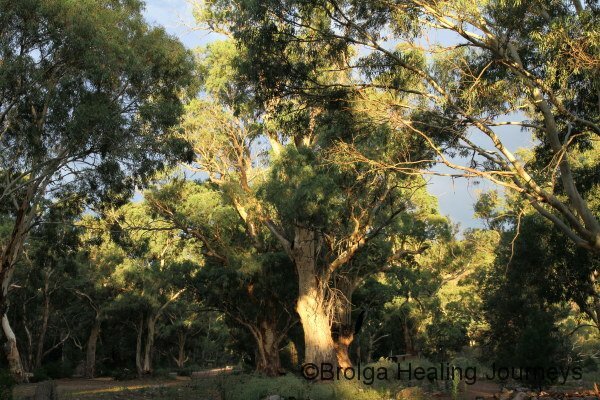 We also spent several days in the lovely town of Melrose, atop the escarpment, from which I was able to complete the 13km return hike to Mt Remarkable’s summit. 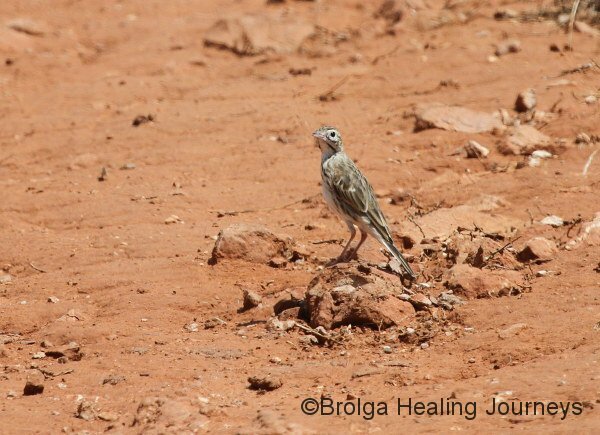 This visit held another surprise for us, revealing yet another facet of the park. 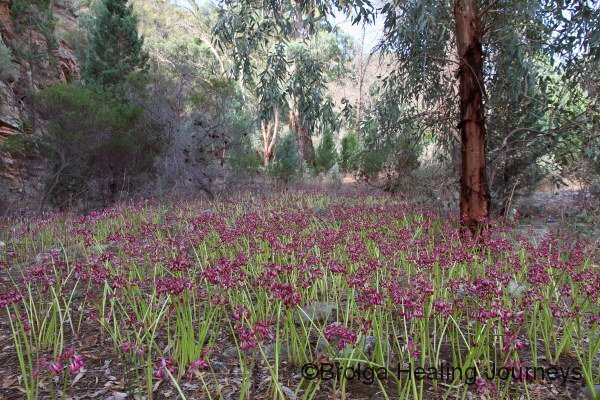 After good summer rains the park was carpeted with the native Garland Lily – a spectacular show of bright pink contrasting with the pale soft grasses and eucalypts. 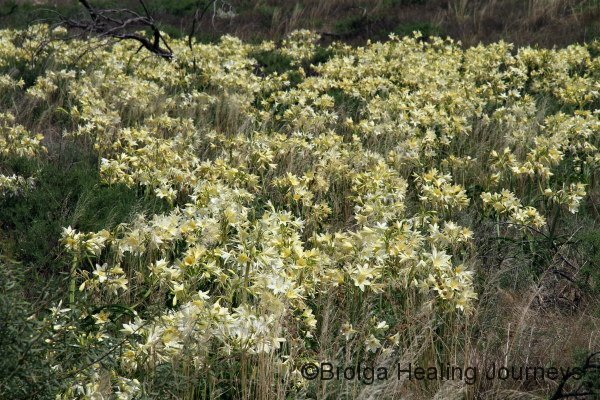 The spicy scent of the lilies filled the air. 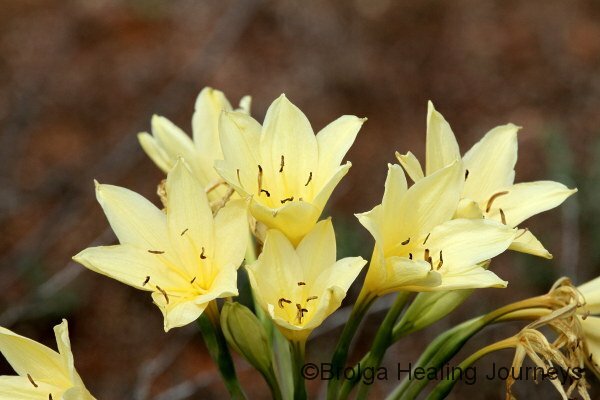 Apart from the lilies, the park was its usual treasure-trove of natural wonders. 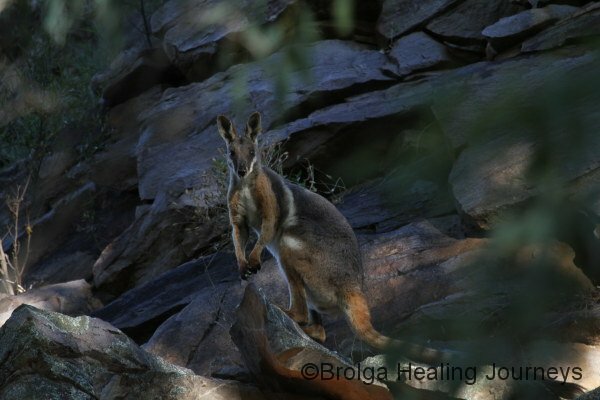 The usual wildlife was around, including our favourite Yellow-Footed Rock Wallabies. 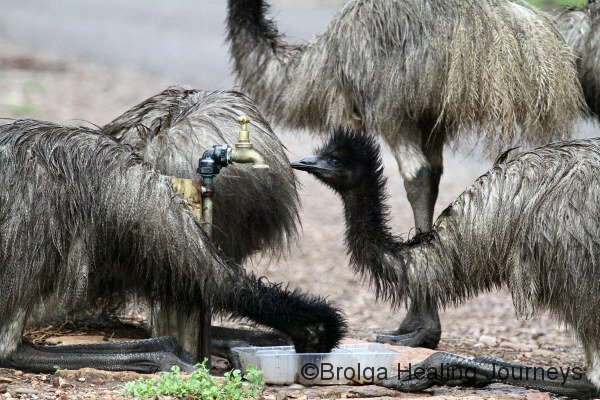 We were visited regularly by Heath Monitors, out and about more now because the weather was hotter than we had experience there before. 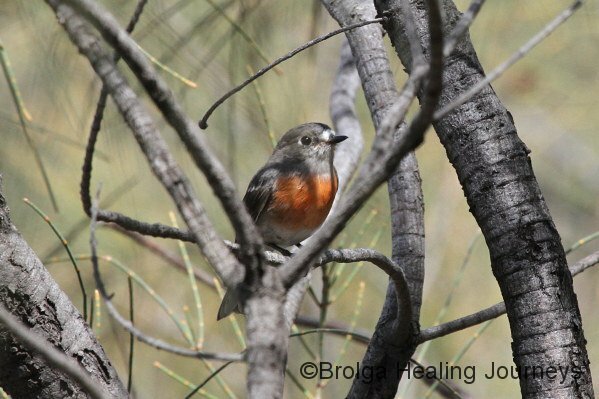 And I was greeted at the top of a grueling climb by a gloriously coloured Flame Robin, our first ever sighting. After a week at the Mambray Creek campground we travelled up to Melrose. This must be one of the loveliest little towns we have visited. 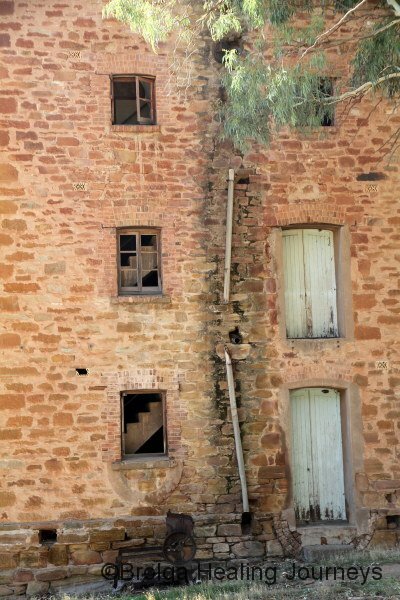 It is nestled beneath the inland slopes of the mountain, and is home to delightful old stone cottages, pubs and other buildings. 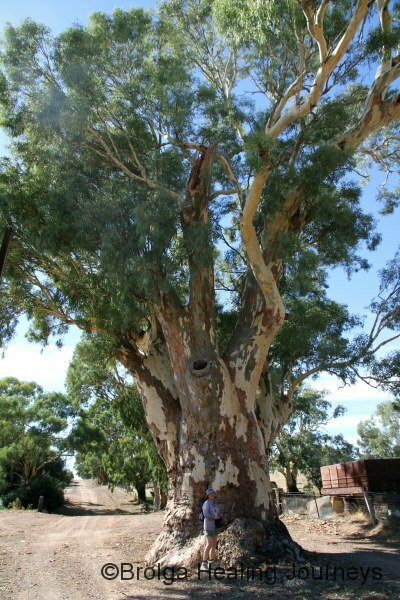 The streets are lined with huge Red Gums, in some instances with roads split to pass around these giants. I fell in love with this little town, even finding a lovingly restoredold home for sale for a great price. All I can say is that it took all of Nirbeeja’s powers of persuasion to prize me out of Melrose. 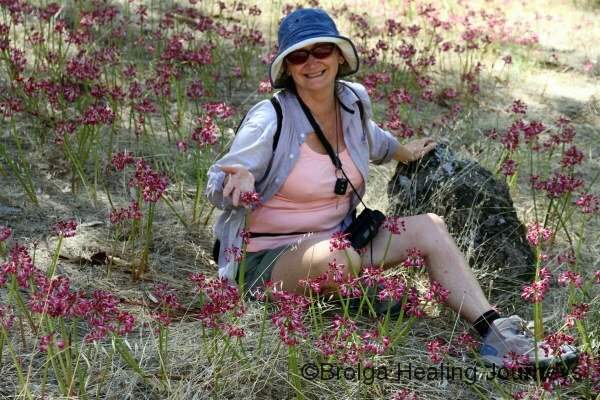 We explored the nature walks around the slopes of Mt Remarkable near the town, offering some different perspectives of the area. 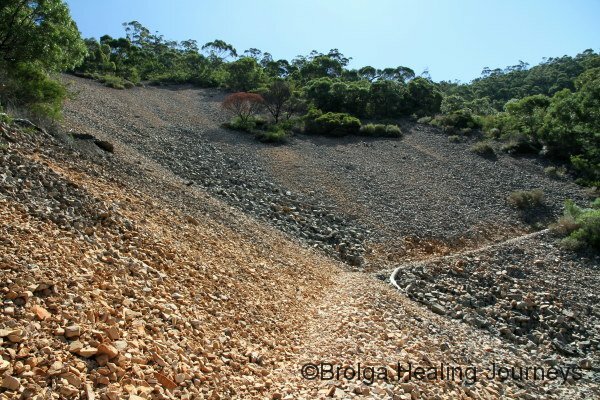 I also ventured up the summit hike, the highlight being the crossing of several enormous scree-slopes along the trail. 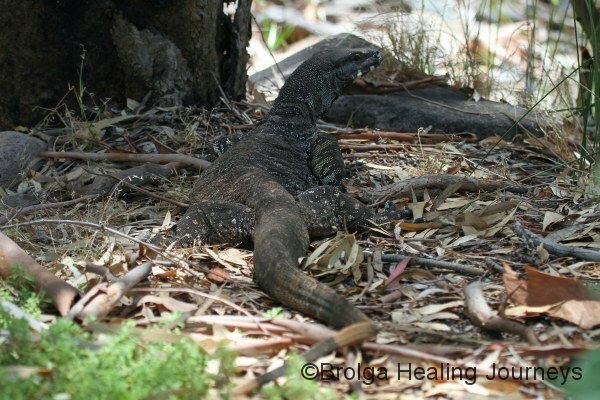 On my descent I startled a Tiger Snake (the uncommon Notechis ater) on the trail, and must admit that I was startled too. 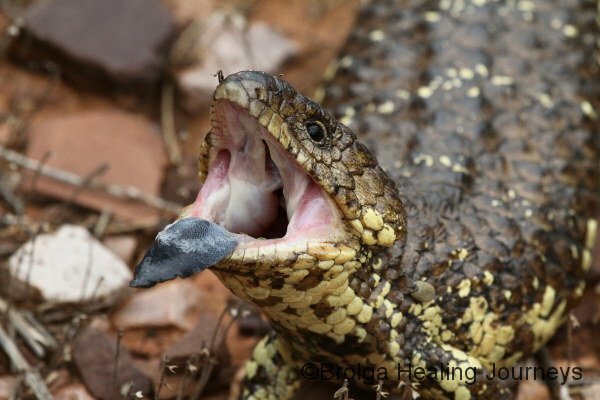 The snake hissed at me, then basically surfed down the grasses and rocks of the very steep hillside, covering twenty metres in no time at all, to escape from me. I had never seen a snake move so fast, and it was a remarkable exhibition of what these creatures can do. I was a little more circumspect after that as I walked along the trail through the tall grass. Melrose gave Nirbeeja a memorable farewell, if you could call it that. 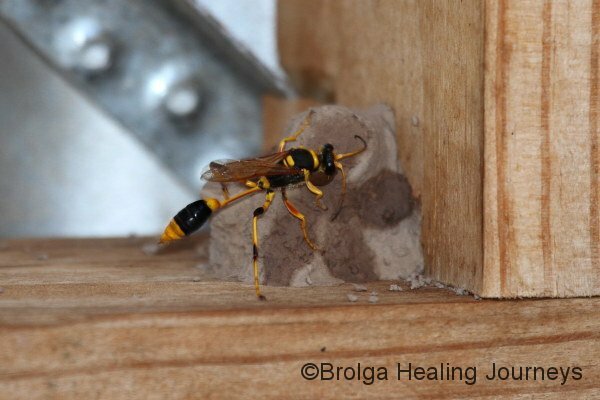 As we packed up our camper trailer, Nirbeeja received a sting on her finger from a scorpion. The scorpion was small – only about 2cm long, but unfortunately these small scorpions have the strongest venom, in Australia at least. 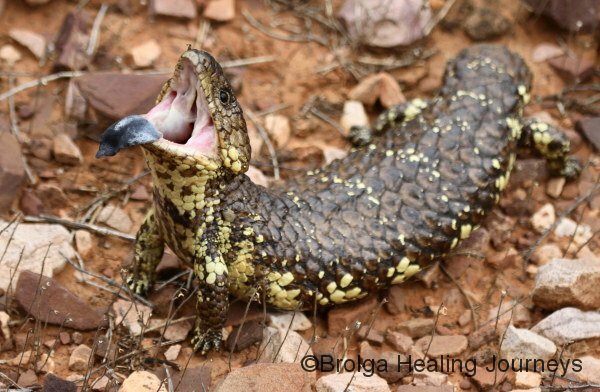 It seems the smaller the scorpion species, the more they rely on venom to kill their prey, while the larger species use the power of their claws. Anyway, Nirbeeja let out a yell, and for several hours felt as though she had a red hot poker through her finger. 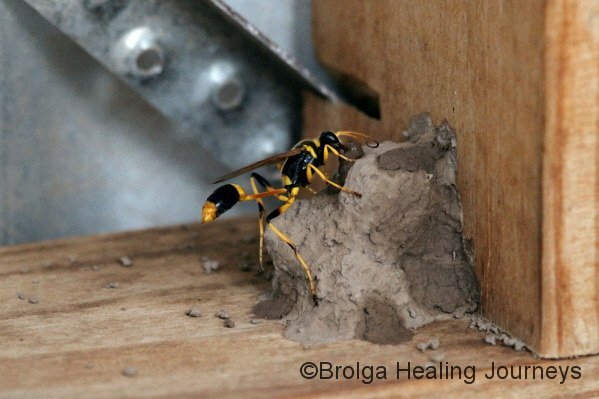 Fortunately, she had no serious allergic reaction to the sting, other than pain. We were lucky enough to have access to ice in Melrose, and found that applying ice to her finger stopped the pain instantly, although the pain re-commenced just as quickly if the ice was removed. 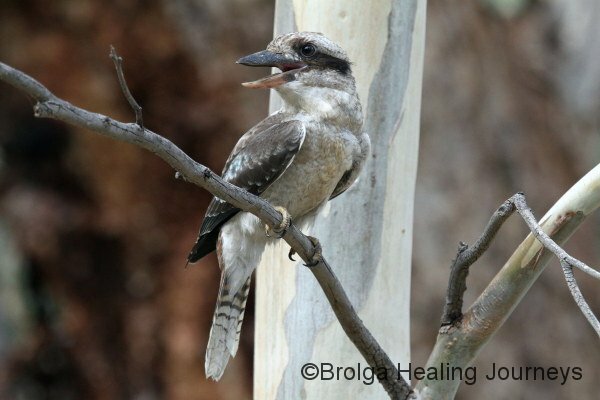 Sore finger and all, we headed off, at last, to Buckaringa Wildlife Sanctuary. 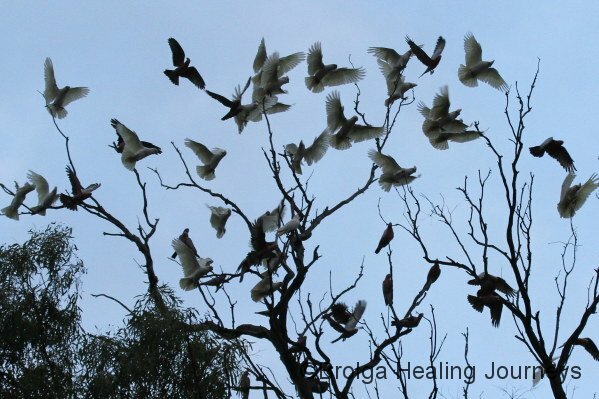 Katja had been delayed at Scotia for two weeks by flooding and road closures, but had eventually made her ‘escape’ and had safely arrived at Buckaringa. 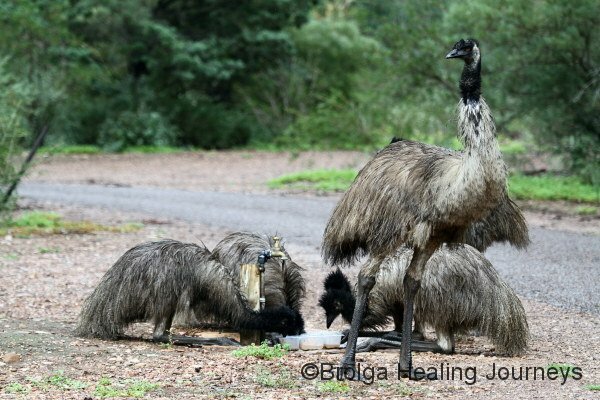 Buckaringa Sanctuary is another of the properties of the Australian Wildlife Conservancy. 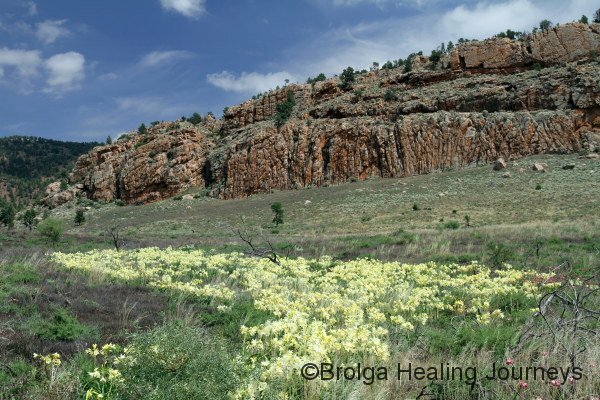 Although much smaller than Scotia, Buckaringa nonetheless has enormous ecological value as a property, as it provides a safe haven and breeding ground for the endangered Yellow-Footed Rock Wallaby. 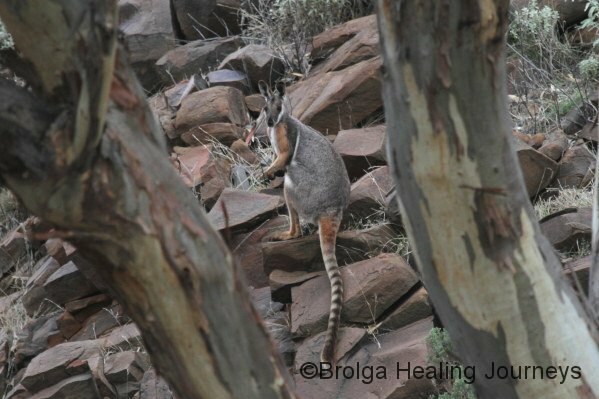 The usual culprits have conspired to endanger this beautiful wallaby – land clearing leading to loss of habitat, predation by foxes, and competition for food and territory from feral goats. 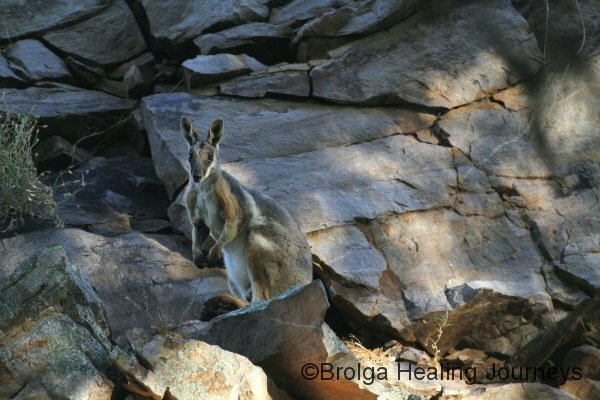 Nirbeeja and I had been fortunate to see Yellow-Footed Rock Wallabies at Mt Remarkable National Park and Warren’s Gorge (near Buckaringa), but only in small numbers. 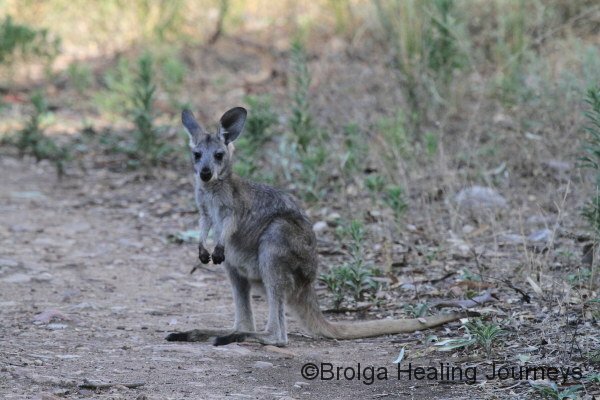 Buckaringa has several good-sized breeding colonies of the wallabies, so we hoped to see them there. 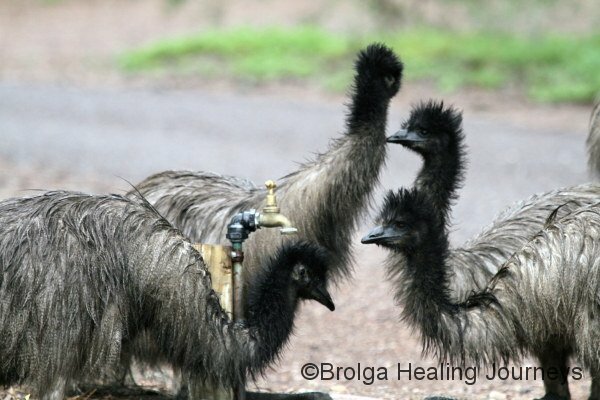 We spent a few days at Buckaringa, staying at the cosy little cottage, lovingly maintained by AWC staff and volunteers. 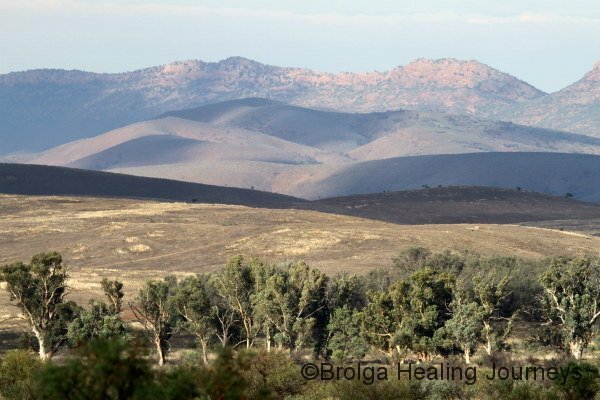 The surrounding hills of the Flinders Ranges provide a stunning backdrop to the sanctuary, an ever changing palate of colours during the day. 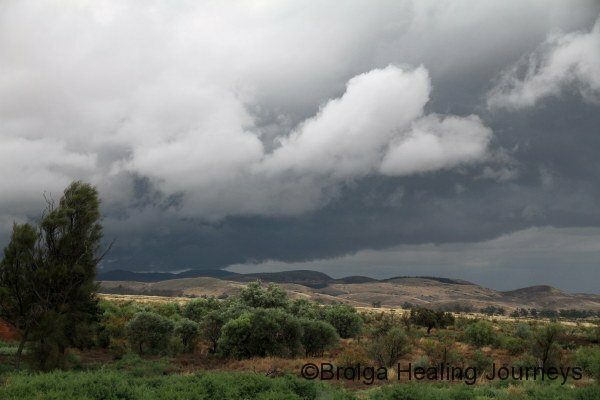 We also experienced a fierce rainstorm, watching as brooding clouds engulfed the hills, then dumped their contents in the valley. 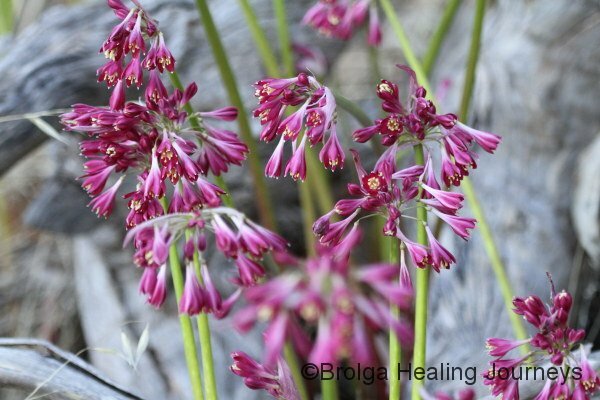 Mt Remarkable had put on a glorious show of Garland Lilies for our stay there and Buckaringa, not to be outdone, had an equally magnificent display of Andamooka Lilies. 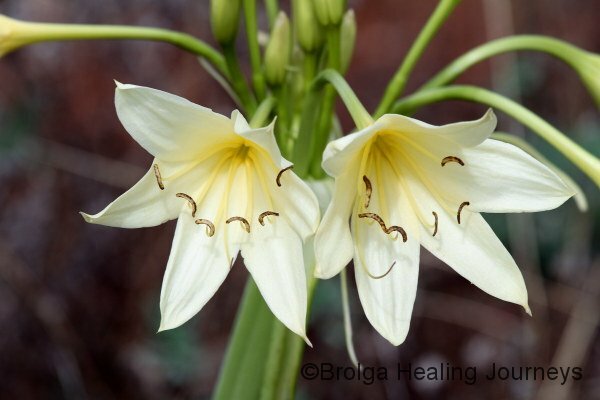 These large, pale lilies swept across the valleys like rivers of gold. 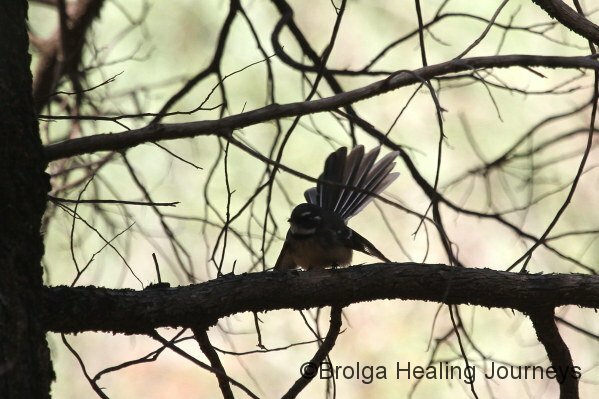 Buckaringa Gorge, from which the sanctuary takes its name, forms the southern boundary of the sanctuary. It is a spectacular gorge, with its deep red cliffs rising to either side of the track. 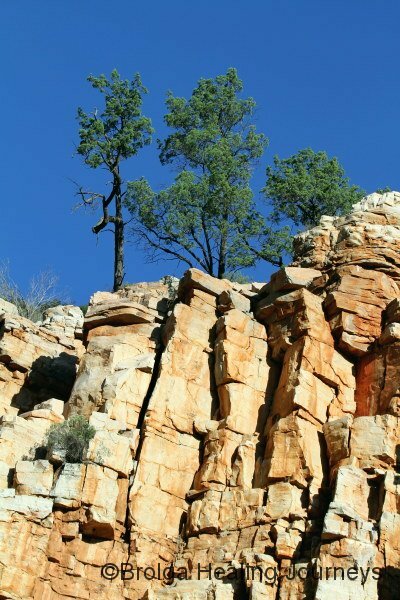 The well-known Heysen Trail, a walking track covering most of the Flinders Ranges and beyond, passes through the gorge. 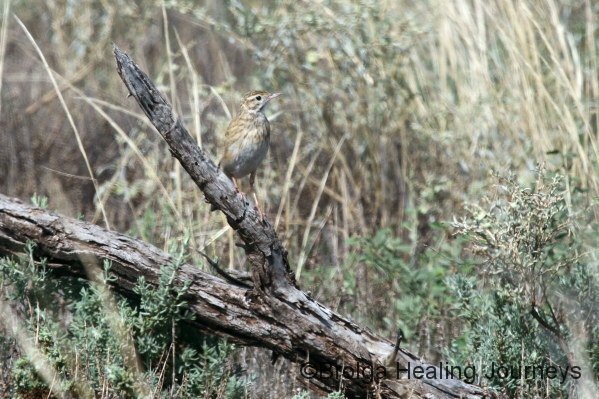 The AWC is working to restore the health of the gorge area, which was adversely affected by land-use during the earlier pastoral life of the property and also by greater use of the road through the gorge in those times. Unfortunately, such damage can take decades to restore. The AWC is also carrying out an intensive program, in association with neighbouring property holders, to control fox numbers. 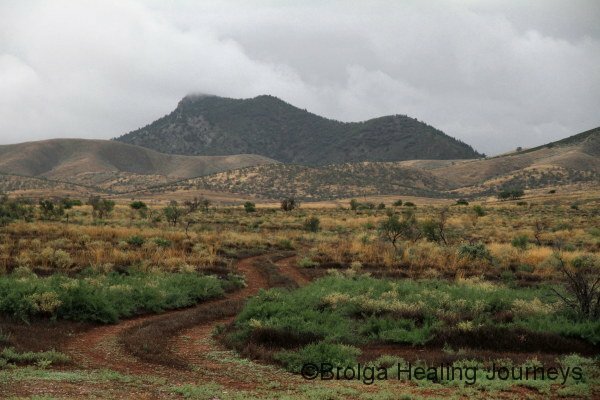 Like much of the Flinders Ranges, Buckaringa also has a problem with noxious weeds due to earlier grazing practices. 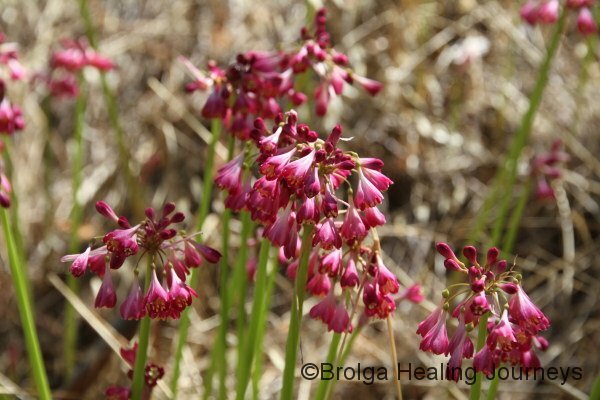 Nirbeeja and I spent some time at Buckaringa pulling out the noxious potato weed, half filling the back of a ute with our efforts, though we barely scratched the surface of the problem. 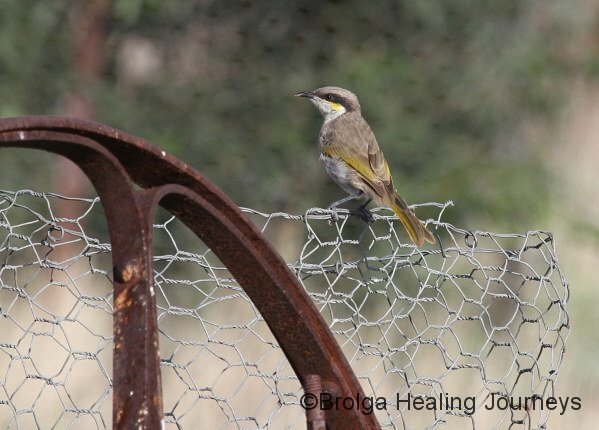 We hope to do more volunteering at Buckaringa in future and make a greater contribution to land-care on the sanctuary. 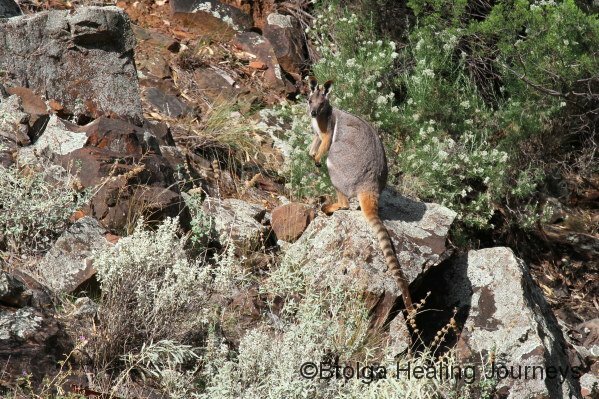 But, lets return to the raison d’être for the sanctuary, the Yellow-Footed Rock Wallaby. Yes, we did get to see them there. 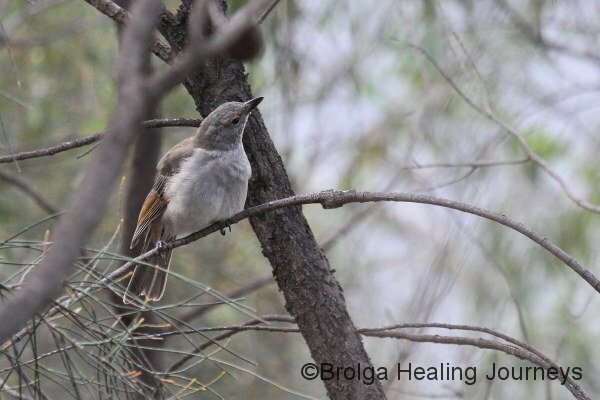 We saw several during our first walk through Buckaringa Gorge, but had much more luck when we walked into Middle Gorge, further within the sanctuary, the following day. We walked into Middle Gorge late in the afternoon, with rain threatening. 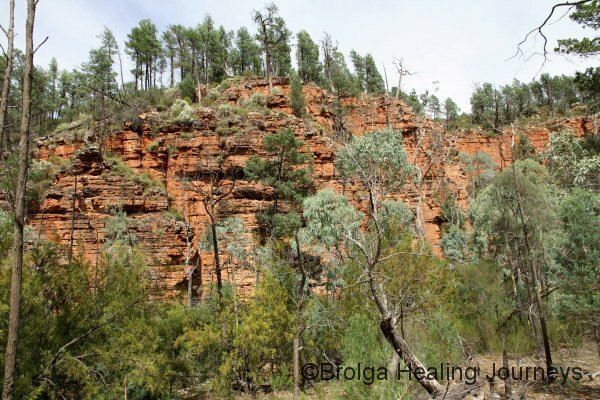 There is no track through the steep, narrow gorge and the gorge seems less affected generally by human action than does Buckaringa Gorge. As a result, there were wallabies everywhere. 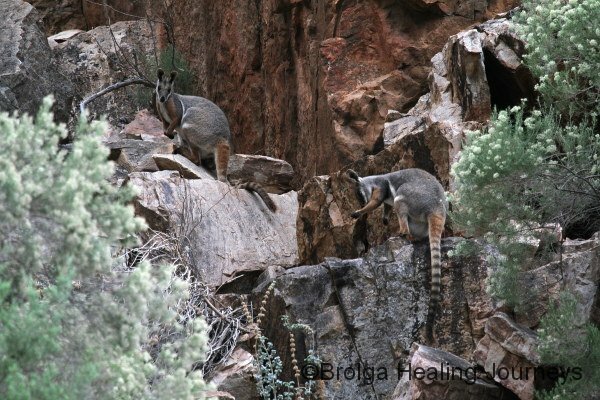 We saw 12, but heard many more as they effortlessly hopped up the cliff-faces of the gorge to escape our presence. 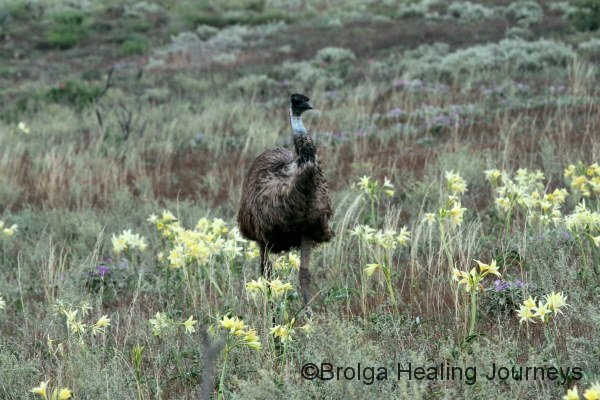 They are beautiful creatures, perfectly camouflaged for the terrain of the Flinders Ranges. 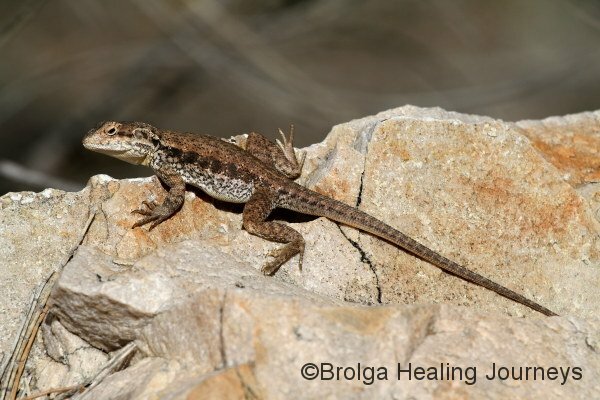 We love the way they sit, high up on the rock-face, with their long striped tail draped across the rock as if presenting it for our approval. Despite the urge to go back again and again, we only entered Middle Gorge once during our stay because we are mindful of the AWC’s efforts to minimize human interference with the wallabies. 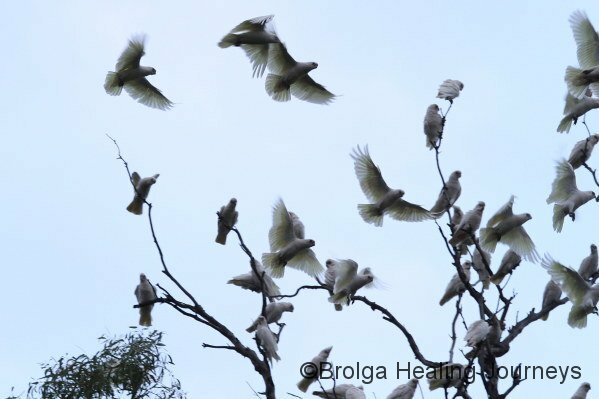 Buckaringa Wildlife Sanctuary was another reminder for us, as if we needed one, of the wonderful work being done by the Australian Wildlife Conservancy across Australia to protect our endangered wildlife. 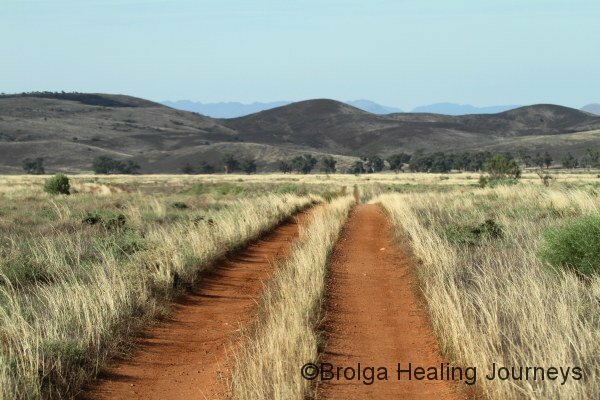 We look forward to returning to Buckaringa for a longer stay next time.